The bluid veshels are the pairt o the circulatory seestem, an microcirculation, that transports bluid ootthrou the human bouk. 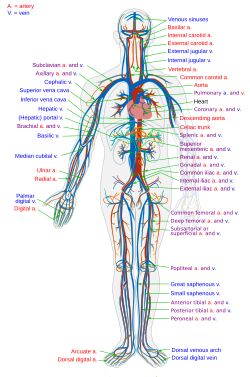 ↑ "Blood Vessels – Heart and Blood Vessel Disorders – Merck Manuals Consumer Version". Merck Manuals Consumer Version. Retrieved 2016-12-22. This page wis last eeditit on 26 October 2018, at 17:57.